The one billionth fixed broadband subscription globally was almost certainly signed up before the end of September this year, according to research outfit Point Topic. 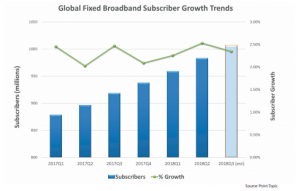 Point Topic’s most recent research put the total number of global fixed line broadband subscribers at 983 million at the end of June. Current adoption rates mean that the billionth broadband line appeared in September 2018. At the end of Q2 2018 the quarterly growth of fixed broadband subscribers saw a boost compared to the previous quarter and stood at 2.5%. The growth was highest in the last six quarters, mostly due to the trends in East Asia which provided 70% of all net additions in fixed broadband subscribers. Almost 50% of all subscribers were also in East Asia, including China. According to Point Topic, about 80% of global broadband subscriptions were fibre or cable-based. 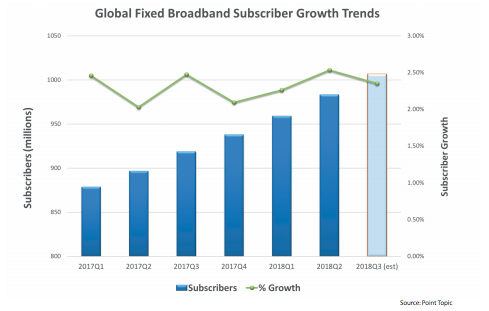 While ADSL connections declined by 8% over the last year, FTTH/B/C connections grew by 30% and cable connections grew by 5%. The year to the end of June saw Chinese FTTH subscription grow by 26%, meaning that China accounted for 80% of global FTTH net additions in this period. 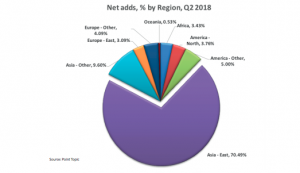 South Africa, Brazil, the UK and France among others recorded significant FTTH quarterly growth rates, while Italy, New Zealand and Greece were among the top VDSL growth markets. Nepal, Indonesia and Vietnam were among the countries recording the highest growth rates. Lower rates of overall growth were recorded in high penetration markets. tracking ahead of most models. Driven by China and other Asian markets the second age of internet expansion is nevertheless showing the effects of market saturation,” said Oliver Johnson, CEO of Point Topic.